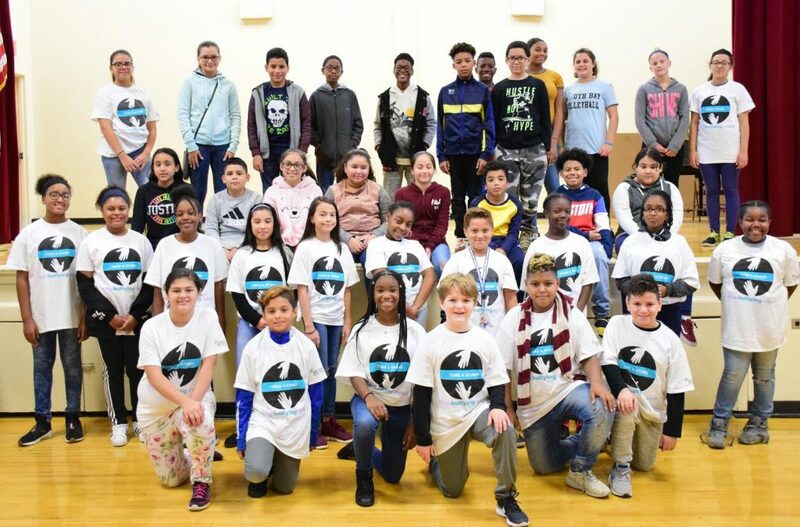 More than 30 sixth-graders from Park Avenue Memorial Elementary School in the Amityville Union Free School attended the Take A Stand anti-bullying program at Hofstra University on Oct. 12. Students from schools across Long Island took part in the conference, sponsored by Hofstra’s WRHU radio station and Northwell Health’s Cohen’s Children’s Medical Center. A few students from each sixth-grade class were selected for the program, in which they attended various workshops. Teacher Deborah Ross said the Take A Stand facilitators addressed a serious topic in fun and engaging ways with skits, games and personal discussions. In one exercise, students sat in circles and learned about the “masks” other children often hide behind. The Park Avenue students will now serve as ambassadors in school and educate their peers about the perils of bullying. The have vowed to not be bystanders if they see bullying taking place, and will stand up for each other. Sixth-grader Tiffany Asbell said she learned how to look out for a bully, as well as how to spot someone who is being bullied, so she and her classmates can help. Photo Caption: Park Avenue Memorial Elementary School sixth-graders attended the Take A Stand anti-bullying conference at Hofstra University.